This page contains articles on the history, philosophy and techniques of Hellenistic astrology. Some of the articles are hosted on our website, while others are links to articles on other sites. 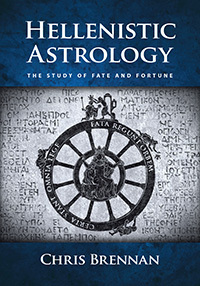 Articles on the history and philosophy of Hellenistic astrology. The Planetary Joys and the Origins of the Significations of the Houses and Triplicities – A new paper on the joys of the planets and the role they played in motivating development of the significations of the houses and the assignment of the four classical elements to the signs of the zodiac. Did Ptolemy Use Whole Sign Houses? – An analysis of references to the “houses” or “places” (topoi) in Ptolemy’s Tetrabiblos, demonstrating that whole sign houses was his primary method of house division. Entry on Hellenistic Astrology in the Internet Encyclopedia of Philosophy by Marilynn Lawrence – An excellent overview of the relationship between Hellenistic astrology and the different philosophical schools in the ancient world. The Transmission of Hellenistic Astrology to India – An article that discusses the relationship between Hellenistic and Indian astrology, and a specific historical hypothesis about the transmission of Hellenistic astrology to India in the 2nd century. The Antikythera Mechanism Was Used for Astrology – An argument that the purpose of the 2000 year old mechanical computer known as the Antikythera Mechanism was clearly astrological, and that its discovery can help to clarify the historical origins of Hellenistic astrology. The Zodiac of Dendera – Pictures, video and discussion about the famous 1st century BCE Egyptian zodiac from inside of the Hathor temple at Dendera. Articles on techniques and practical concepts in Hellenistic astrology. Whole Sign Houses – An article on the original form of house division, known as whole sign houses, which was the primary system of house division used in Hellenistic astrology. The Sect of the Planets – The distinction between day and night charts, and the division of the planets into two teams or sects. How to Calculate the Lot of Fortune – A video demonstrating how to calculate Lots visually, using the Lot of Fortune as the primary example. The Theoretical Rationale Underlying the Seven Hermetic Lots – This paper explores the seven “Hermetic” Lots that appear in the work of the 4th century astrologer Paul of Alexandria and his commentator Olympiodorus, and proposes a theoretical rationale underlying their construction. Serapio of Alexandria: Definitions – translated by Eduardo Gramaglia for the Hellenistic Astrology Website. A compilation of excepts from a Greek astrological text attributed to Serapio. Full biographies of each of the major astrologers and sources from the Hellenistic tradition can be found on our Hellenistic astrologers page. Timeline of Ancient Astrologers – A concise timeline of all of the major Hellenistic astrologers, including some important dates in the history of astrology. Diagrams and tables for specific astrological concepts and techniques, in PDF format. Planetary Rulerships Table – traditional rulers, Egyptian bounds, Dorothean triplicity lords. Triplicity Rulers – according to Dorotheus, Valens, and Rhetorius. Joys of the Planets – according to Firmicus, Paulus, Rhetorius, and Olympiodorus. Enclosure and Intervention – according to Antiochus and Porphyry. Right and Left Sided Configurations – according to Antiochus and Porphyry. The Dodekatopos – significations according to Hermes Trismegistus (1st century BCE). The Octotopos – significations of the places according to Asclepius (1st century BCE). The Twelve Places – significations according to Valens (2nd century CE).